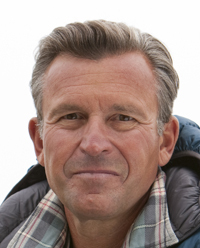 World-class climber and bestselling author Ed Viesturs, the only American to have climbed all of the world’s 8,000-meter peaks without the use of supplemental oxygen, will discuss his seven summits of Mount Everest in a Nov. 4 presentation to benefit the independent Community School’s Outdoor Program. According to a news release, Viesturs will discuss his new book, “The Mountain: My Time on Everest,” at 6:30 p.m. at the Sun Valley Opera House. The event is sponsored by the Eddie Bauer sportswear and outdoor gear company. Eddie Bauer backpacks and gift cards will be raffled off at the event. Iconoclast Books will sell pre-signed copies of Viesturs’ new book prior to the presentation. A VIP reception with Viesturs will be held after the presentation in the Sun Room at Sun Valley Lodge. Event tickets are $25 for adults, $15 for students and $75 for the VIP reception. To register, visit edviesturs.eventbrite.com. All proceeds will benefit the Outdoor Program, which is one of the largest in the Northwest and has been an integral part of the school since its inception. Students climb mountains and cliffs, run river rapids, explore wild coasts and deserts and live in snow shelters. A purpose of the program is to help students develop leadership skills and the confidence to take risks to overcome challenges and adversity.